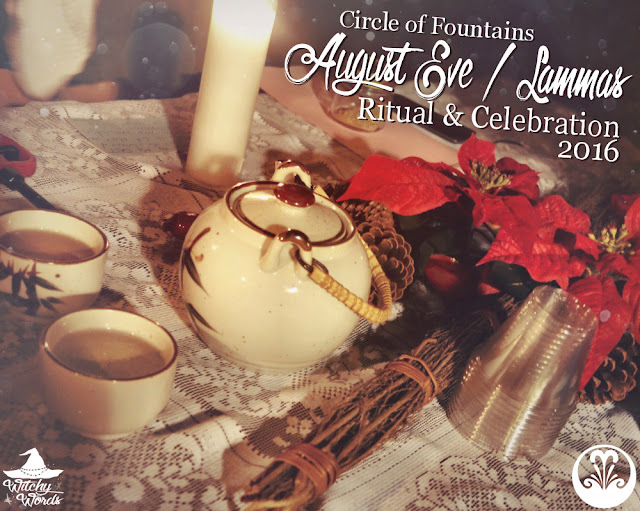 This post will cover the August Eve / Lammas / Lughnasadh ritual and celebration held by the Circle of Fountains. For Circle of Fountains 2015 August Eve Ritual, click here! This year's August Eve ritual was held by Amy! Each sabbat, a different Circle of Fountains member writes and leads the ritual. Each member has a different belief system or practice and often incorporates that into their celebration. Amy has written for Witchy Words in the past about her Cartesian Dualism in her Wiccan path. You can check out that article here. Her pragmatic approach to her path is evident in the celebration and ritual she put together at her house on Sunday! Typically, we start off the celebration with some sort of craft. 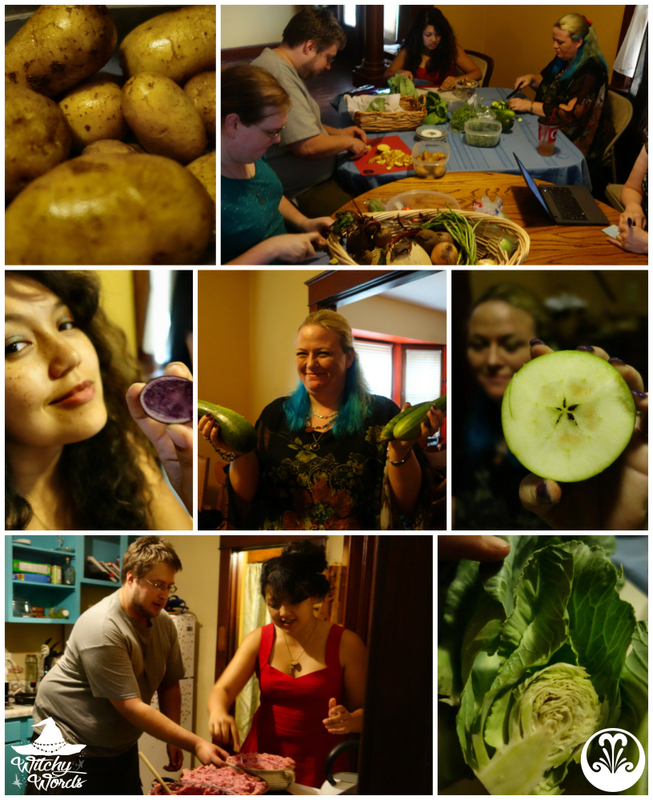 Amy wanted to combine the craft with the potluck we typically have by supplying organic local produce - along with some contributions from fellow ciremates' gardens. Our "craft" project was to then prep the food for that night's meal! A huge thank you to my husband for taking over for me on food prep. While I did some slicing and dicing, I mostly stuck behind the camera at this point. Once the food was just down to an oven timer, we went outside for ritual! Amy set up this gorgeous main altar as the centerpiece of our circle to stand around. One by one, we called the quarters and opened the circle. On Imbolc, because Amy is so incredibly on top of things, she had each of us draw a name from a hat (well, a box, but you get the point). We were told to purchase or create a small, simple gift that reflected the goals, interests and personality of the person whose name you drew. The idea is that the harvest rituals are much like pagan Thanksgivings - a time to celebrate friends and family. By giving each other a gift, we celebrated our circle. Gifts ranged from thrift-stored trinkets, spells and sachets to handmade gifts, books and more. Of course, being snarky is a requirement of our circle just as much as being loved is. ...and bee sting (mead and cider) as ale. When the teapot of mead and ale got around to Amy, there was none left to pour. So, like the family we are, we all gave a little from our own cups to help fill the cup of a circlemate. With that, Amy's ritual was complete! We bade farewell to the elements and closed the circle. Once the circle was closed, we headed inside for dinner! And the berry-stuffed apples were delicious! 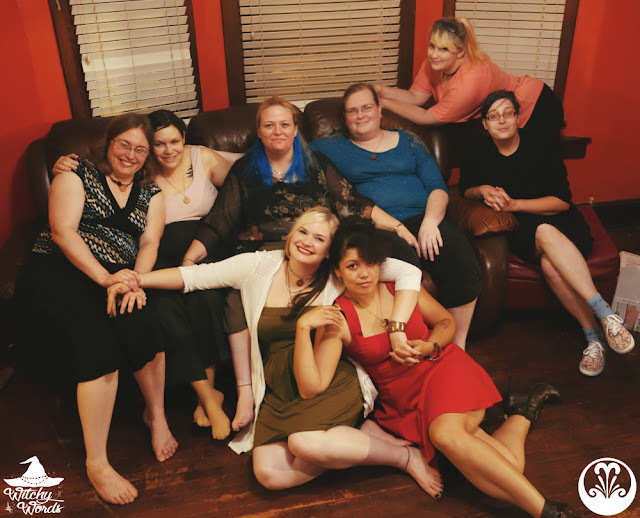 Amy's ritual was fantastically put together and exactly what the circle needed after this long summer. Now that we're in the harvest season, we can begin to reap that which we've sewn all year long. From my circle to yours, I hope you had an amazing August Eve! To see the previous Circle of Fountains sabbat ritual, Midsummer, click here! I always love seeing how Circle of Fountains celebrates the Sabbats, and thank you for reminding me that I still need to celebrate Lammas. Another thank you for introducing me to the idea of Bee Sting - this I have to make! What are the proportions and what kind of cider is best to use? I saw varying recipes online, but went with a 50/50 mix for simplicity. Since mead is quite sweet by nature, I chose a fairly dry cider, to provide balance. I have a question..I'm just starting in paganism but today I saved a crow that was hurt on the road I stopped the cars from hurting him further. I picked the little guy up and he passed in my arms going to the vet. I held him the whole time telling him I'm here I'm going to help him but he passed. I was just wondering if there's any sort of thing I can do to help him after he is gone. I started crying as my boyfriend helped me burry him. I'm just asking to see if I have any bad luck or anything on me now because some have been telling me to cleanse myself blah blah. I feel personally that I will have good karma and luck just because I tried to help him I made him as comfortable as I could as he passed. Please and thank you so much. I wished him the best and lite some candles and incense and sage around him as we buried him. I doubt you'll have any kind of bad luck. You did your best to help him. If you'd like, you can always set up an altar dedicated to him or to crows in general and give it offerings. You can also give offerings directly to the local crows. I'm not a professional - so always ask a vet or a specialist - but I understand that local fruits, nuts, eggs, worms, raw grains and cat food with low phosphates and few additives tend to be pretty healthy for crows.